The other FFA directors, Ian Dicke and Steve Snowden (who are doctoral students at UT Austin with me and by that very virtue are, you know, in close proximity) had not asked me. Which is cool, but just…odd? I had never written an article in my life (that I can recall), and I couldn’t for the life of me figure out why anyone would think that I could. This is not a matter of false modesty. If someone sent me an email asking if I could make pesto I could do it, but I would think it an odd an sort of non-sequitur request in my day. 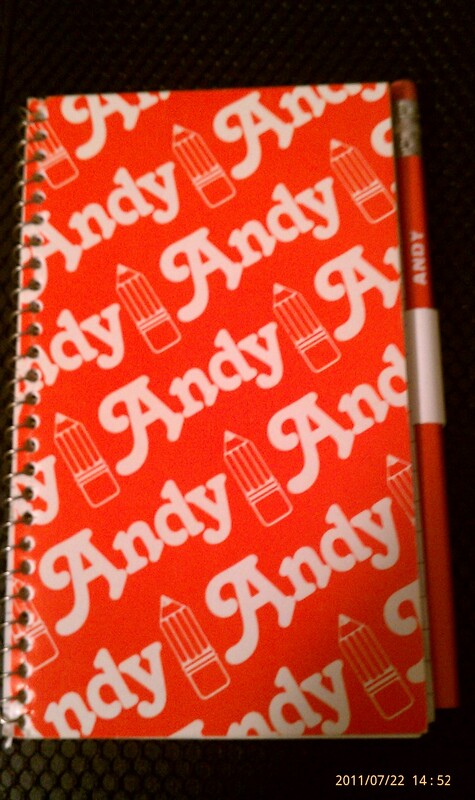 Even the pencil says "Andy"...thanks Baba! and a few days later found myself at an all-day new music festival. The festival went well and the following week I sent the article off to NMB, which I promptly forgot about as I entered the final few weeks of the semester. Then in early July I got an email from Molly asking if I’d like to be one of four regional editors for NMB. I was flattered and interested and accepted the offer. I’ll be writing a few stories a month for NMB as well as keeping the New York office abreast of the regional new music happenings around here. So go to NMB and check ’em out!